Barney Ross and his team of highly trained mercenaries “The Expendables” are offered a job on the island of Vilena in the Gulf of Mexico. The team need to overthrow the brutal leader General Gaza and restore peace to the island. As the misson unfolds the team learn more about themselves and what it means to fight in a unit together. The Expendables is a bad movie. Stallone feeds audiances a sub-par story that is in no way compelling, lazy dialogue and relies heavily on explosions to tell the story for him. This is what makes The Expendables so much fun to watch. 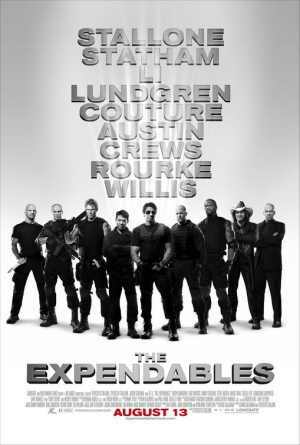 Filled with corny one liners, a testosterone filled cast of action stars from days gone by and thrilling stunts not involving CGI; The Expendables offers a chance to switch off your brain and just have fun at the cinema. Sure it lacks an oscar winning story and performances but it sure does have a lot of balls to the wall action. Why only 2/5? I thought the movie achieved what it set out to do perfectly. I agree, the movie acheived what it set out to do perfectly. Just because it achieved being a no brainer action film doesn’t make it a good movie. It was watchable, it was fun but it won’t be taking away awards. Push comes to shove I can watch Die Hard, The Terminator or Rambo countless times over and over, but I’d only find myself watching The Expendables one or two more times. What we get is pure, unadulterated B-movie stuff, with an A-budget. And although it should have been so much better, I still had a great time, watching things, and people explode, like it’s the 80s all over again. Check out my review when you can, nice review! !